Currently an adjunct professor in Monitoring & Evaluation in Global Health at Drexel University School of Public Health, Tererai Trent was an 18-year-old wife and mother of three living in a Zimbabwean village when she began to dream of a better life. As a young girl, she had watched as a “relay of poverty” took hold of those around her. The relay passed a baton from one to another; from her great grandmother to her grandmother and mother, before it was extended to her. Inspired to dream, and with her mother’s encouragement, Tererai wrote four education goals on a scrap of paper, slipped it into a tin can, and buried the can in the ground; homage to a sacred connection to the earth. Her mother suggested a fifth goal: giving back. Tererai lives that belief. She is convinced we have a moral obligation to look out for each other, and to end the relay of poverty. Tererai was a keynote speaker at the UN Global Compact Leaders Summit, and in 2018, won the NAACP Award for Outstanding Literary Work. She founded the Tererai Trent International Foundation to create opportunity through access to quality education, with a focus on girls and developing nations. 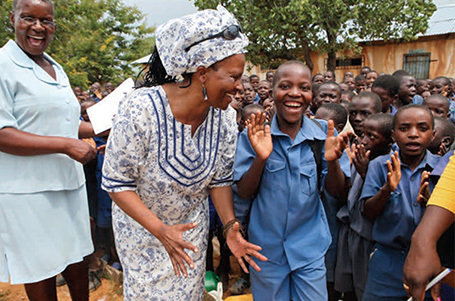 Through strategic partnerships with Oprah Winfrey and Save the Children, Tererai’s mission to provide universal access to quality education while also empowering rural communities is now being realized. Tererai lives that belief. Tererai lives that belief. She is convinced we have a moral obligation to look out for each other, and to end the relay of poverty.